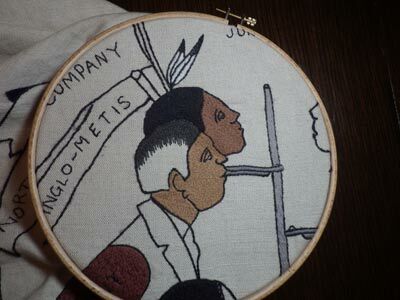 During the past year and a half, the internationally acclaimed art project known as the Scottish Diaspora Tapestry Project has been touring the world. The project consists of 305 hand-embroidered panels, all designed by Scottish artist Andrew Crummy. Each panel reflects and celebrates the diverse history of the Scottish experience around the globe, from the settlements and explorations to the many important scientific, architectural, economic, and cultural contributions that continue to the present day. 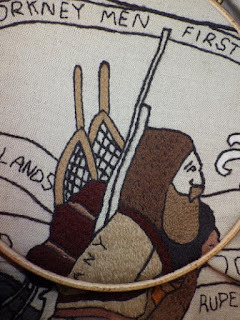 Winnipeg, Manitoba will be the second stop on the North American tour of the Scottish Diaspora Tapestry Project. You won't want to miss the opportunity to view this spectacular exhibit! Thirty-four countries, including Canada, and hundreds of international volunteers have participated in the project since its design inception in 2014. Within Canada, volunteers assisted in the completion of 37 regional panels that are part of the ongoing touring exhibit. Each embroidered panel measures 20 inches square (51 cm x 51 cm) and took approximately 200 hours to complete. 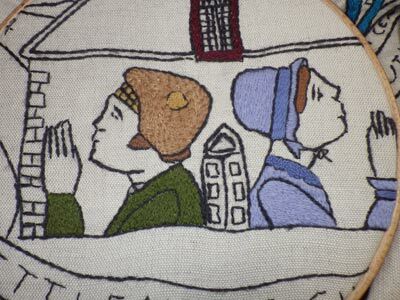 Most panels were completed by several stitchers, but some were done by only one or two people. Some volunteers were beginner stitchers and some were experts; many guilds and individual members of the Embroiderers' Association of Canada participated. Some stitchers were members of Scottish Highland Dance groups, Scottish Pipe Bands, or other Scottish cultural groups. Some had no Scottish roots at all but just wanted to participate in this exciting project. Every stitcher immortalized their work by placing their initials on each panel on which they worked. Join us to view this fantastic display of embroidery and history! You don't have to have Scottish roots to be thrilled! For more information on the Scottish Diaspora Tapestry Project check out the official website. please contact Lorraine Iverach by email.